Sandwiched between the Golden Age of the 40's and the Silver Age of the 60's, the comics of the 1950's remain underrated. Full of imagination, colorful characters and plots, the times of Cold War, atomic mutations, and anything-goes storylines are a wealth of entertainment that today's generation seldom gets to see. And then there was love.... by the thousands young reader absorbed the romance comics. The comics of love probably influenced the relationship perception of an entire generation, for better or for worse. 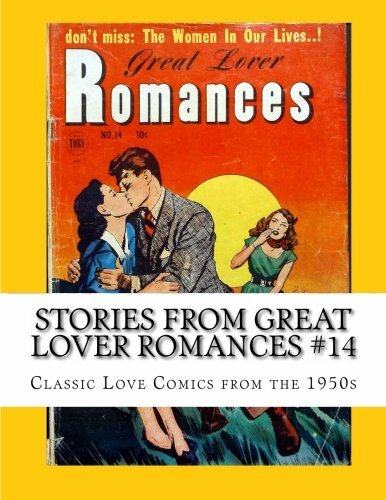 This book contains the full issue GREAT LOVER ROMANCES #14, not seen in print for decades. The comic reprints from Calumet History and Hobby are reproduced from actual classic comics, and sometimes reflect the imperfection of books that are decades old. These books are constantly updated with the best version available - if you are EVER unhappy with the experience or quality of a book, return the book to us to exchange for another title or the upgrade as new files become available.